The hemorrhaging at Centegra Health System is getting worse. 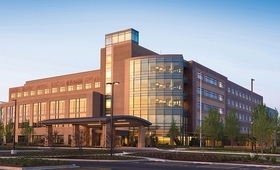 The far northwest suburban Chicago hospital network ended its fiscal year June 30 with a $62.3 million operating loss for the year, according to a new unaudited financial statement. That's more than double the $30.1 million loss reported at the end of the third quarter, for the previous nine months, and much worse than the up to $40 million loss hospital officials had projected for the year. The latest financials come a year after Crystal Lake-based Centegra opened a new hospital in suburban Huntley, at a time when most health systems are beefing up cheaper, more convenient outpatient sites, and in the midst of finalizing a merger with powerhouse Northwestern Medicine. Streeterville-based Northwestern has been snapping up far-flung suburban hospitals, growing from one to seven medical centers since 2010. Centegra and Northwestern first announced their potential deal in April 2016. Their union was supposed to close at the end of 2016, and now is on pace to wrap up by the end of this year. Centegra's new financial statement shows annual revenue grew 13% since 2016, totaling $564.2 million, but expenses climbed faster. They jumped 27% from the previous year, totaling $626.5 million. That fueled the $62.3 million operating loss for the fiscal year ended June 30, compared with a year-earlier profit of $4.3 million, according to a Crain's analysis. Meanwhile, long-term debt totaled $397.7 million in 2017, up from $370.3 million the previous year. A Centegra spokeswoman did not return a call seeking comment. Centegra blamed part of the third-quarter loss on covering patients who won't or can't pay their medical bills. That's a common complaint these days among Chicago-area hospitals, many of which have announced major cuts in recent months as they rein in spending. Centegra is making other moves in a bid to wring out savings. The system has asked state regulators for permission to end the bulk of traditional inpatient beds, including intensive care beds, at its Woodstock hospital and relocate some services to its hospitals in Huntley and McHenry. "Centegra Health's condition worsens" originally appeared Crain's Chicago Business.